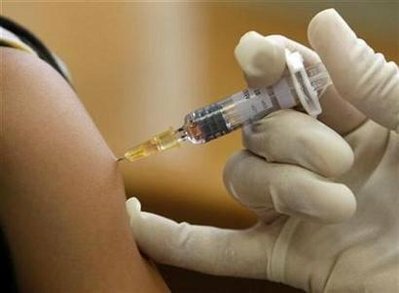 WASHINGTON (Reuters) – Nearly two-thirds of U.S. parents say they will hold off having their children vaccinated against the H1N1 swine flu or will not get them immunized at all, according to a survey released on Wednesday. The findings, published by Consumer Reports, underscore one of the main challenges facing the Obama administration as it readies a massive swine flu vaccination roll-out — how to persuade the most vulnerable people to protect themselves against the new virus. H1N1, which emerged last March and became a pandemic in June, puts children and young people at greater risk than the elderly for severe illness and death. Pregnant women and people with underlying medical problems such as lung disease or diabetes are at higher risk. Consumer Reports, a magazine published by the nonprofit advocacy group Consumers Union, surveyed 1,502 adults by telephone from September 2-7. It found that 50 percent of parents are delaying the vaccination decision, mainly because they were wary about whether the new H1N1 vaccine has been tested enough. The same concerns were shared by 14 percent of parents who have ruled out vaccination altogether. About 35 percent of adults surveyed said they would definitely have their children vaccinated, significantly higher than the 22 percent of 5- to 18-year-olds who are immunized in a typical year, according to federal statistics. The survey also found 43 percent of parents were not too worried about their children contracting H1N1, while about the same number worried about other parents overreacting. The poll has a 3 percentage point margin of error and was taken before the U.S. Food and Drug Administration approved new vaccines for the H1N1 virus. Preliminary test results have since shown children respond to the new vaccine just as they do to seasonal flu vaccines, with those over age 10 needing a single dose but children under 9 needing two. Consumer Reports said it recommends that people within high risk groups consider immunization when the vaccine starts to become available next month. The U.S. government has ordered vaccine from MedImmune, a unit of AstraZeneca, Sanofi-Aventis, Australia’s CSL, GlaxoSmithKline and Novartis. U.S. health officials, who say immunization provides the best protection against flu infection, warn that low vaccine demand could now have dire consequences. The elderly are a prime target for seasonal flu strains that kill about 36,000 people during mild outbreaks. But officials warn that many of those deaths this season could be children aged 18 and under. The Obama administration plans to begin distributing vaccine doses next week as part of an immunization campaign that should ramp up to over 250 million doses by the end of the year. H1N1, currently the dominant flu strain, has infected millions of people in the United States, and in late summer, intensified strongly in the U.S. Southeast where the school year tends to begin early.